How can Santa Cruz rethink its transportation system to put equity and the environment at the forefront? 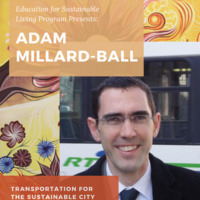 This talk presents a vision for how faster buses, safer biking, walkable neighborhoods and affordable housing can move the city away from the private car, and provide a model for other California communities. Join us this Monday at 5:20pm at Kresge Town Hall for this lecture organized by the Educaiton for Sustainable Living Program! These lectures are put on with an affliated course (CRSN 61 and 161) and are open for all to attend.